Again today I have met people for whom mangroves are their “home ground,” the material and spiritual centre of their lives. Raised as children in the mangroves, they raise their own children the same way. “Father to child to grandchild,” said Janilson, 49, who talked to us with a friend who goes by the nickname Piaba, a type of fish. Janilson said there were 150 families around Caravelas who live in the mangroves. They don’t have regular jobs. The mangroves are “their industry, their business, their life,” he said. Piaba takes us upriver to a mangrove community near Caravelas. These men were acute observers of nature. Their eyes lit up when they talked about creatures they’d seen in the mangroves over the course of their lives. Snakes weighing 7 kg. Fiddler crabs whose local name means “call the tide,” because that’s what they seem to be doing when the males wave their supersized pincer. Crab-catching raccoons. That’s right—at low tide raccoons go into the mangroves and catch crabs by inserting their tails into the burrows and waiting for a crab to latch on. Piaba delightedly mimicked the yelps of the raccoon as it withdrew its prize. Some of their stories crossed over from the natural to the supernatural. They claimed that fishermen sometimes catch in their nets the spirits of dead children, which refuse to show their faces. Piaba said that one night in the mangroves he had once seen a ball of fire which pulsated among the trees as he watched. 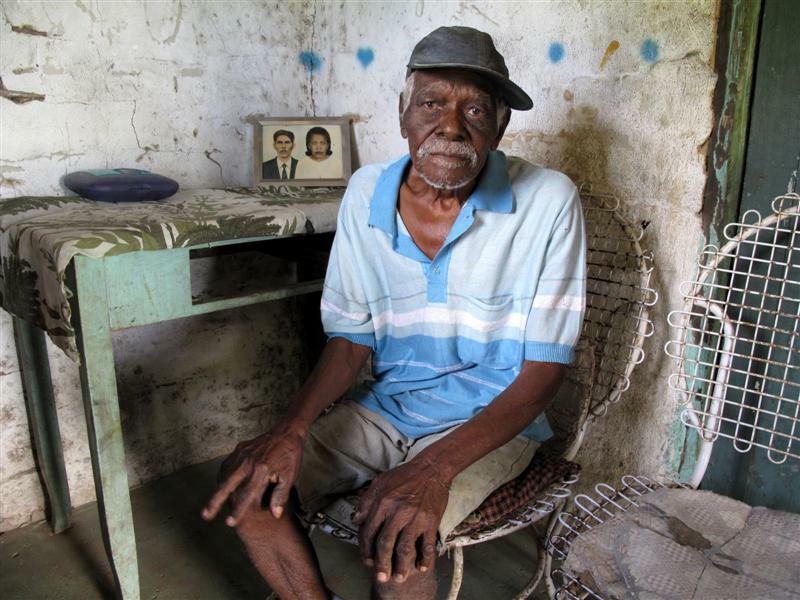 Seu Silvano, 86, raised 21 children in a mangrove community near Caravelas. 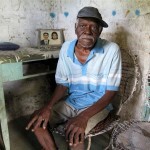 Later, Piaba took us up the river bordering Caravelas to meet 86-year-old Seu Silvano and his wife. They live in a mud-walled hut in which they have raised 21 children. Silvano came to the land as a young single man, cleared and planted it with fruit and shade trees, built the house and will live in it until he dies. It was some of his upriver neighbours who sold their land to Coopex for a shrimp farm. One of Silvano’s sons told us, “They were crazy to sell.” Crazy because they knew what the farm would do to those who remained. “The effluent would have affected everything. Once it was contaminated, the river wouldn’t have served anyone,” said the son. I asked Seu Silvano if he still collected food from the mangroves, but he said his body was too tired now. But he still knows how to sweeten crabs for market. As we walked back to the river he lifted a wooden slat from a box under a mango tree. Several dozen blue crabs scuttled away from the light. Silvano feeds them plantains, leaves and coconut to improve their flavour before his children take them by boat to Caravelas. It’s a process that has been happening forever, down among the mangroves. Dó, Dedê and Jaco Galdino Santana are three brothers who work to promote the Afro-Indigenous culture of Bahia, on the eastern seaboard of Brazil. 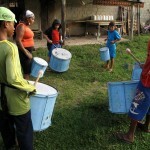 They live in Caravelas, a quiet colonial town near the southern border of Bahia state. 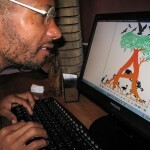 Dó Galdino Santana with the first letter of a magnrove font he designed. Ten years ago, it would not have occurred to them that mangroves could disappear. Mangroves were part of their life, as they were for everyone in Caravelas. “We couldn’t imagine living without them,” said Dedê. Then came Coopex, a consortium with a plan to build a 1500 ha shrimp farm on land between two rivers adjacent to the town. It would be Brazil´s largest shrimp farm yet. The developers claimed that the farm would not have a negative impact on the mangrove ecosystem, but bitter experience elsewhere in Brazil suggested otherwise. 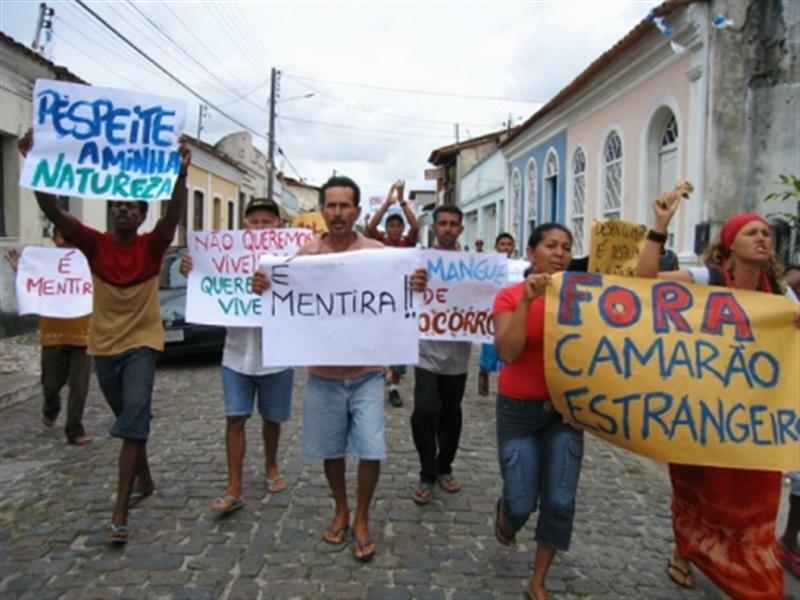 A delegation from shrimp-devastated communities in Ceará visited the Caravelas community to urge them not to allow shrimp to get a foot in the door. 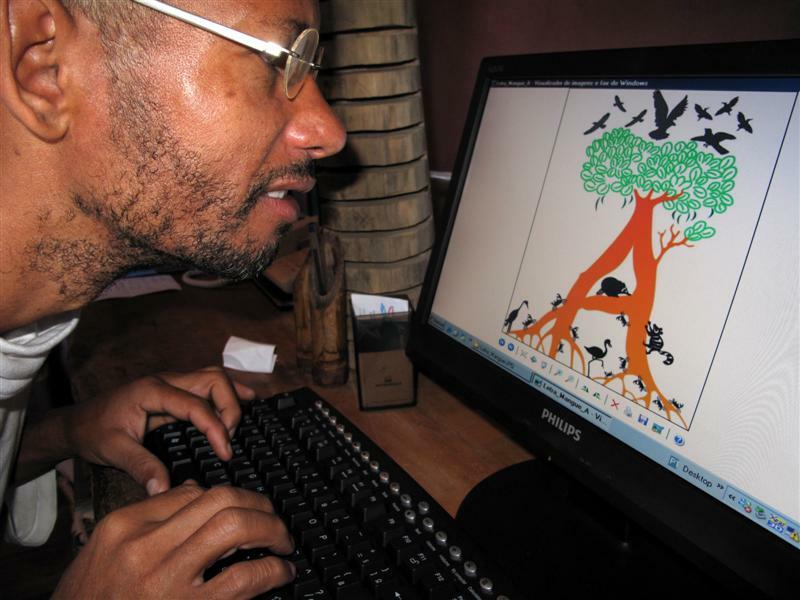 The threat of environmental degradation and mangrove loss caused the brothers to evaluate their priorities. As well as helping mobilise the community to oppose the shrimp project, the brothers decided what was needed was an affirmation of cultural identity. It was not enough to be against something from the outside that threatened their way of life, they wanted to assert what made Caravelas unique. 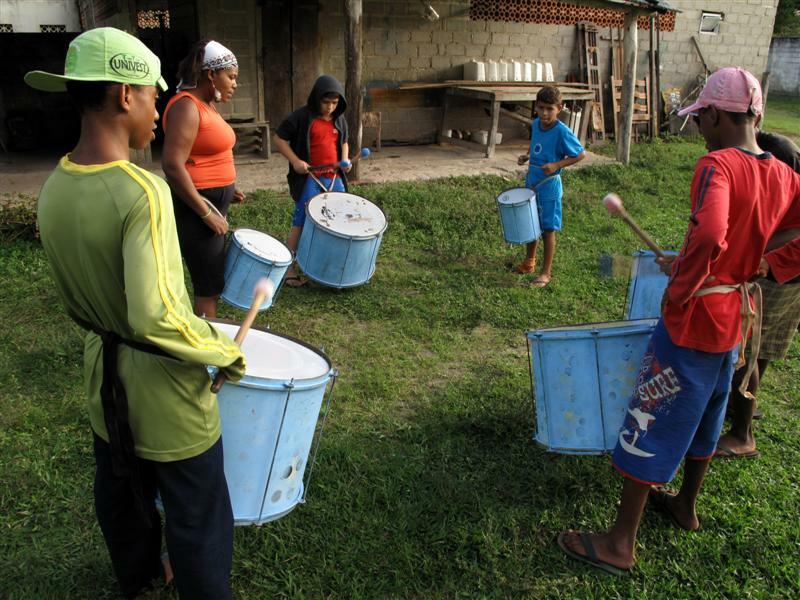 Teaching Afro-Indigenous culture to the children of Caravelas. 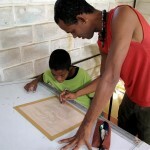 They had already started a cultural centre offering the children of the community classes in everything from drumming to carving, silk-screening to sculpture. A fourth member of the family, brother-in-law Itamar dos Anjos, taught drama and dance. They decided to explore the artistic possibilities of mangroves. 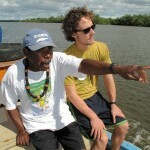 “Nature is integral to the Afro-Indigenous identity,” said Itamar, and because mangroves and marine life were directly threatened by the Coopex proposal, the brothers and community members, in collaboration with the Mangrove Action Project, decided to make a short film celebrating the spiritual and cultural significance of mangroves. The film evokes the three orixas, or African deities, which are jointly responsible for mangroves: the goddesses of fresh water (Oxum), salt water (Yemanja) and mud (Nanã). A current of mysticism runs through the film. As well as the orixas, there is a mythological figure called Caipora, who lives in the mangrove branches, protects wildlife and comes to the aid of people who are lost. In the film his cackling laughter terrifies the businessmen who expect their briefcases of money to sweep all opposition before them. 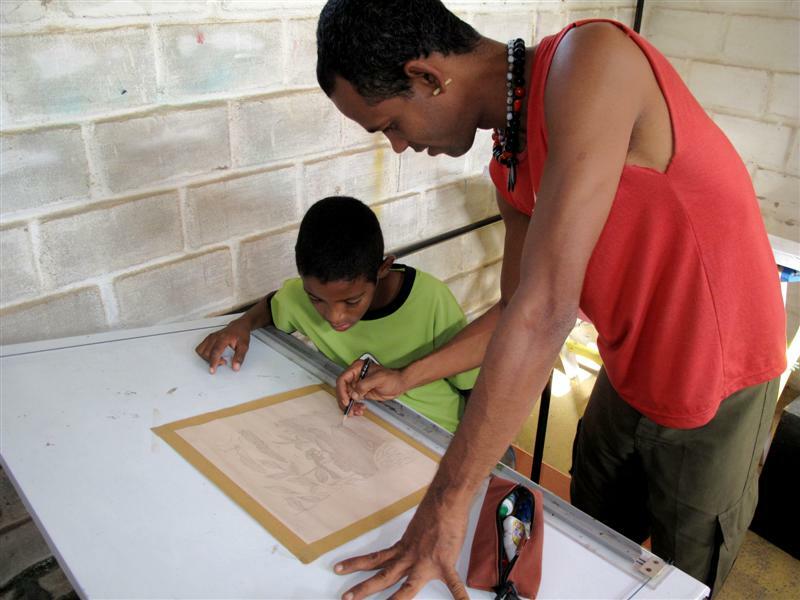 Dedê Galdino Santana helps a young student with his drawing. In reality, opposition from the community caused Brazil´s federal environmental agency to reinvestigate Coopex’s proposal, and to rule that the siting of the farm was an inappropriate land use. The proposal has now been abandoned. 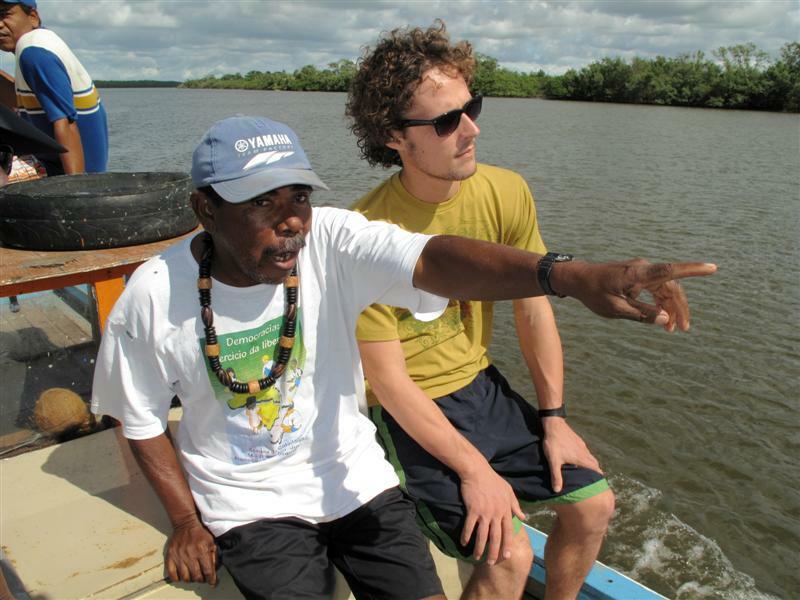 “The shrimp farm proposal re-awoke in the community the importance of mangroves,” said Itamar. The outcome has been not just a threat averted, but a deeper vein of cultural identity revitalised.